It seems like every phone that I see at CES 2008 I want to make my next mobile phone, and the Samsung SCH-i760 is by no means no exception. 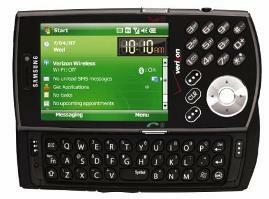 There is certainly a lot to like about this phone that Samsung was displaying quite proudly at CES 2008 this year. Number one, it slides up to a QWERTY keyboard, which is always a seller as we enter into the era of the smartphone. This QWERTY keyboard is completely separate from the numeric keypad, which means no switching off from letters to numbers. The phone has full Windows Mobile 6 Professional access, including Word, Excel, and Powerpoint. You can check your email and stay connected securely with Wireless Sync or Active Sync. You can also use the phone as a tethered modem thanks to Broadband Access Connect, and it is fully Bluetooth compatible. It is also fair to rave about the music playing capability. Oh, I forgot to mention the touchscreen, which works in cooperation with a stylus that fits nicely into the side of the unit itself. Right now, you can purchase the Samsung SCH-i760 for about $449.99 with a 2-year contract price. It is also available at the Verizon wireless site for $349.99. It is a nice phone, but would it kill you to write better than a junior high student?